Bundesliga | On the wing or through the middle: What is Christian Pulisic's best position? Pulisic (l.) has proven positionally and tactically versatile despite his tender 18 years. On the wing or through the middle: What is Christian Pulisic's best position? If at the age of 18 there is already debate about where – and not if – you should be playing at senior level for club and country, then clearly you are no ordinary talent. Such is the case of Borussia Dortmund and USA starlet Christian Pulisic, whose career has skyrocketed since he first broke onto the scene in January 2016. The teenager has primarily played on the wing for Die Schwarzgelben, but recent encouraging performances, including three assists against AC Milan, in a more central position have indicated his ability to play anywhere across the midfield. Pulisic possesses speed, an incredible work rate - he averages over 10.2 kilometres per game - and a fearless willingness to take on his marker in one-on-one situations that would put his avatar on FIFA 17 to shame. Those are highly sought-after attributes in wide players, which is perhaps why former Dortmund coach Thomas Tuchel fielded him either on the right or left flank more often than not. His three goals and eight assists in the Bundesliga in the 2016/17 season attest to his effectiveness in the role. Yet he is also comfortable on the ball and has a pass completion rate of 73 per cent in the league last term– a highly respectable return for an attacking player whose job is to play riskier balls forward. That may be what prompted Tuchel to select Pulisic in central midfield away to none other than 11-time defending European champions Real Madrid in Dortmund's final Champions League group game in December - a game in which Dortmund sealed their progress at the top of the group with a 2-2 draw. Furthermore, on Matchday 18 last season he replaced Gonzalo Castro in the centre, and was in a more central attacking role against Ingolstadt on Matchday 25, while former USMNT coach Jürgen Klinsmann put him in the middle against Mexico in the narrow 2-1 loss in November 2016. That he only has a sprinkling of appearances in the centre makes comparisons difficult, but the chances are good that he will be given more game time there. After all, it appears to be part of a development strategy at Dortmund to make young players more versatile. For example, during last season,Ousmane Dembele also played in the middle and up front, while Erik Durm has played at right-back and on the right-wing. New USA coach Bruce Arena recently commented that he is open to the idea of testing the youngster in the centre, telling Sports Illustrated: “I actually think [he can do] both. We’re going to see his comfort level when he gets into camp and talk to him a little bit. Until recently, he was playing out wide [for Dortmund] and at times playing in a real two-way role, so he had a lot of defensive responsibilities. He’s demonstrated at a young age that he’s capable of getting the job done in a lot of positions." Pulisic himself is keeping his options open. "Right now I'm just happy to be anywhere on the field, I just love to play," he said during a recent Facebook live event with US Soccer. "Whether it's more of a wider role like I've been playing this past year pretty often - I love playing there - or more centrally, I'm also very happy." However, the Hershey, Pennsylvania native did give a major hint about where his future may lie, given the superstar role models he trains with on a daily basis and the opportunity to play in front of so many fans in Dortmund: "I've learned so much from Marco Reus. It's great to have him on the team. I think he plays a similar style to me, so I'm learning a lot from here. It's only going up from here." Think you know Dortmund's wonderkid? Then put your Pulisic knowledge to the test! That will be music to the ears of his admirers, which include prominent figures such as Bundesliga legends Lothar Matthäus, Raul and Mehmet Scholl. 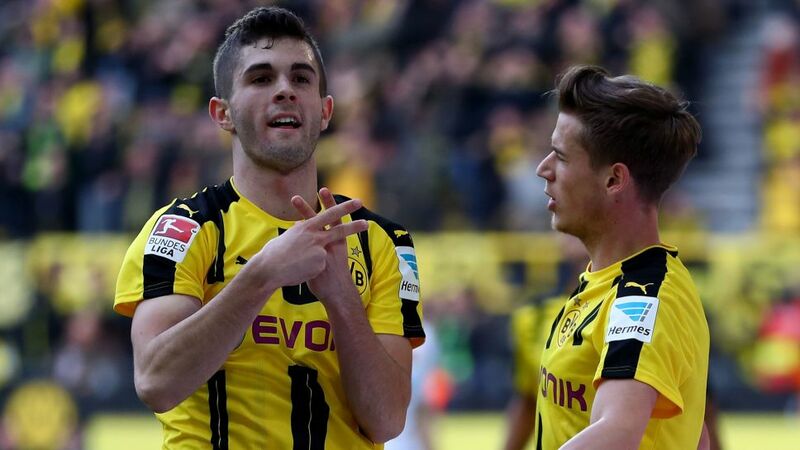 Indeed, the latter, a former Bayern Munich star, appears to be in no doubt about where Pulisic should play, telling Germany television channel ARD: "He can give you an edge over the wings, which few players can do. He's able to create situations that usually never happen." Where Pulisic ultimately establishes himself remains to be seen, but as long as he is somewhere on the pitch, Dortmund and USA fans will undoubtedly be lifted out of their seats.